The jigsaw is a very important tool. Sure, you can cut large plywood sheets by hand, with fine handsaws, but this saw can move a lot faster than you ever could. This tool is a must. Get it cheap, get it expensive, depends on what you want to do. If you plan on building more than one boat, then get a better one. 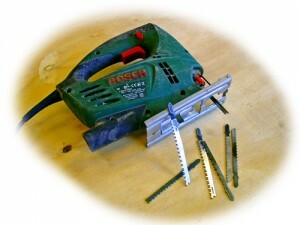 On the picture you also see several cutting blades. We have an assortment of them. We have special blades for laminate, for cutting metal, for cutting trough denser wood and such. For plywood, it is a good idea to get a laminate blade, because otherwise you chip the edges of the cut. The rest is not really that important. Variable speed comes handy when you have to get crafty with this device, eg. cutting very small radius cuts.